Highlights from the Rotary International Convention in Toronto, Ontario, Canada, where there’s Inspiration Around Every Corner, June 23-27, 2018. DG Dave and Bernadette Whalen at the Toronto Convention. On the left is PDG Ernie Montagne of District 5500, Tucson AZ, and on the right is DGE Tom Drennan of District 6060, Overland MO. DG Dave and Bernadette Whalen at the Toronto Convention. On the left is PDG Ernie Montagne of District 5500, Tucson AZ, and on the right is DGE Tom Drennan of District 6060, Overland MO. The booth DG Dave is visiting in the picture is for an event sponsored by District 5500. 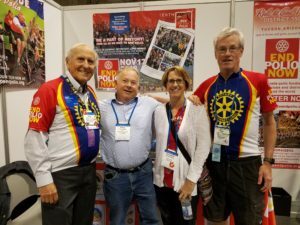 The Ride to End Polio is a bicycling fundraiser hosted by Rotary District 5500 and held each November in Tucson, Arizona, USA, in conjunction with El Tour de Tucson, one of the largest annual bicycling events in the US. In 2017 the Ride to End Polio raised US $11.7 million including the Gates Foundation match. Since its inception in 2009, the event has raised more than US $45 million, enough to purchase more than 50 million doses of polio vaccine. Rotary E-Club of District 7530 member, Bonnie Branciaroli with husband, Mark, attended the Rotary International Convention in Toronto, Canada. 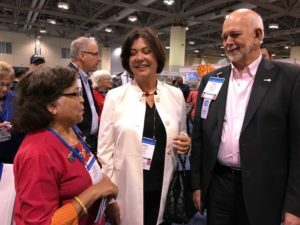 Rotary E-Club of District 7530 Membership Chair and founding president, Richard Phalunas, and new member and Public Image Chair, Bonnie Branciaroli attended the Rotary International Convention in Toronto, Canada this past June. Richard attended with Rotarian Julia (Past President of the Rotary Club of Morgantown, WV) and their daughter, Rotaractor Caitlin. Rotary Conventions are not new to this Rotary family as this was Richard’s 12th, Julia’s 11th, and Caitlin’s 10th (at age 22 years) – having travelled to RI Conventions not only in the US and Canada, but also Singapore, Argentina, England, Portugal, Denmark and Sweden. Richard believes that RI Conventions offer a unique opportunity to learn what Rotary is all about, and the impact that one Rotarian’s service can have. Furthermore, it is also the one place to sense truly the enormity of difference that Rotarians really make around the entire world! Rotary International Convention 2018 General Session. This year’s RI Convention was made very special with the attendance of thousands of Rotaractors from around the world who came to celebrate the 50th Birthday of Rotaract. Rotaractors were evident everywhere – as Convenor, speakers, and attendees at General Sessions, as well as in Breakouts. Additionally, they could be seen “dancing to the music” during entertainment and in the Closing Ceremonies – like Rotary has never seen before. Bonnie arrived later in the week and took in several of the breakout sessions, along with the General Session, including: “How to Conduct a Community Assessment”, “Rotaractors are PRESENT Rotarians”, “Insights and Results from Recent Rotary Research”, “Global Grants 101” and “E-club Best Practices”. The Phalunas family and the Branciarolis plan to attend next year in Hamburg, Germany, and in Honolulu the following year.